it’s just put in Mod folder and use it or it need some “zzz..” in the front of the first name? Wow Freddy what amazing work with the skin the trucks looks very pretty, so my friend let me congratulate for this AMAZING work!!! @ Phillip, Thanks mate, i do my best hey? @David King – What site are you trying to download from? I am following where it says download off of ETS2.lt. 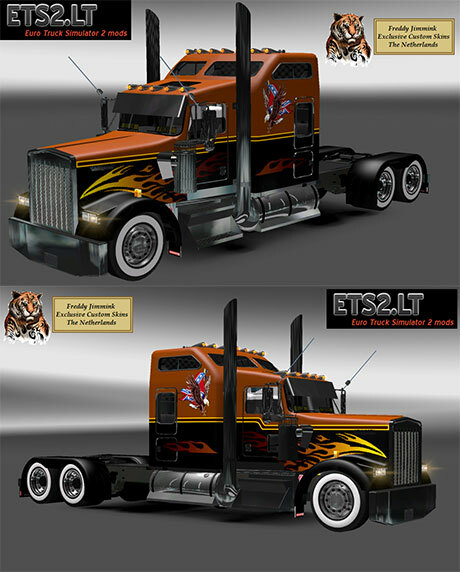 When I click download above it takes me to Mulitiupload.nl then on that page it has Kenworth W900L South Eagle Skin by Freddy Jimmink.rar (31.51 MB), but no download button. any download button wants me to download and install something called xvidly_setup.exe. David, when this takes you to the screen that shows the various links, press zippy share. I advise you to download the free version of Adblocker plus, you wont see iLivid rubbish, all those are false advertizing that you don’t want on or in your PC. Never download a file or exe unless you know it is legit. If the file you want is called 1234.exe and it shows you zyxw.exe then don’t click it. Those pages that are Adfly and they say in the top right corner with a countdown, wait for the countdown to finish then press SKIP AD>> Good luck! Many of us use these links with no issues, once you figure out what not to press, it is easy. Remember google Adblock plus and install it for your browser, you’ll see much less nonsense. Thank you guys now have adblocker plus for Chrome and it has stopped the BS. Have the skin now and the Smokey and the Bandit skin. LOVE them just wish could chose which one to on truck in paint but can change the look by simply not adding one or the other when I edit profile. Thank you guys. Nice skin but where do you get the tyres? Aww!! This skin looks fantastic. It’s a shame it doesn’t show up in my game. The truck is cool to drive slow and cumbersome, but fun. I’m sooo disappointed the skin doesn’t work. Go to colors and make the truck white, maybe that will help? Outstanding skin Freddy-thank you for your work. I just downloaded the truck but your link for this skin are not working anymore.